Because – you are special. And because I’m special too (that’s why my daddy bought me 8 bags of Trader Joe’s gf granola when he went to Albuquerque). I’ve had this mix sitting around in my pantry for a little while – something I won from a raffle probably (gotta love those raffles). It called to me today, crying out to be made. I was happy to oblige. It’s a really easy mix – just add milk, butter, and a little oil, and beat it (I used my $5 hand mixer). I folded in some frozen blueberries (because I love blueberry muffins). The batter is a bit sticky to get into the muffin cups (but probably would be easier if you weren’t using muffin liners that your child had previously flattened). The bag said it would make 9, but I got 12 with the blueberries (about a half cup). The verdict: they were really tasty. I had 2. My dad said “these are really good” and Braden said “Mommy, you make the best muffins.” (Does it get any better than that?) They did have a little bit of a very fine grit to them, but I was feeling for it (so I could tell y’all about it). These are very good, and I would definitely make them again. I just wanted to share one other thing with you today. 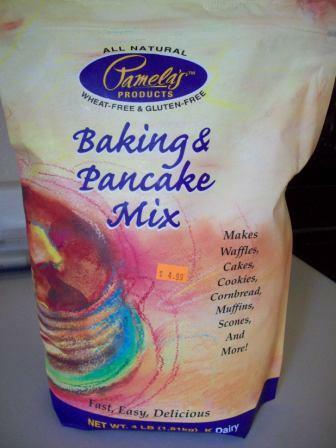 At the salvage grocery store, I scored a 4 pound bag of Pamela’s pancake and baking mix for only $4.99. I guess I will be trying that in something soon. I wish I had a salvage store with Pamela’s baking mix so cheap. I love the stuff. It makes great drop biscuits, and it also makes great chocolate chip cookies. Lucky you! Hello Cassandra! I just happened upon your site because I made a muffin mix yesterday. I love the look! 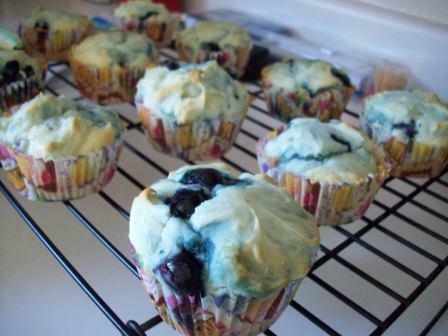 I actually tried the Whole Foods brand “365” muffin mix, also with blueberries, and the mix just didn’t come out sweet enough to me. I’m wondering if your mix might have turned out a bit sweeter, and I’m thinking next time I’ll add some cinnamon and some sugar to the mix. Also, I don’t think we have that brand out here, but I adore the name! Honestly, we celiacs *are* pretty special, aren’t we? that is so not fair! I don’t have a salvage grocery store! As my little nephew would say, “Poo on you!” haha! 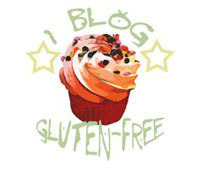 That’s so cool you can find gluten free things there!